Great summer drink licorish & orange flavors. This is another one real classic. This is a real's man drink, beautiful flavors. Very nice, citrusy, creamy and like a candy. This is a pleasant drink, refreshing, easy to drink. Nice notes of fruit. This week is a great classic, the Bourbon is the center piece of the drink, the ingredient are paramount for this coctail. This week is a well balanced drink, nice blend of aromatics and fruits, but it is a strong dry drink. This week is the mother of all classics: The Dry Martini. This is a drink that will let the Gin shine, the better the quality, the aromatics, the better the drink. In a future post we will reveal some of the Gin's we have been experimenting with. - Olive brine for a dirty martini. This week we are trying a real man's drink... The blend of vermouth and scotch gives it a funky nose, wonderful flavor, not a beginner's drink. We try with single malt, it is much better with a blended scotch, the peat of a single malt is too much for the drink. This week we are trying another old classic. It ends up being fresh, beautiful, well balanced, a wonderful summer drink. This week is an old classic rarely done (at least the right way): The Whisky Sour. I prefer it with a somewhat neutral (not too much sweetness, wood, or peat)like Canadian Whisky. It is the right a well balanced drink with touch of sourness. A great Classic. This week is the big daddy of classics: The Manhattan. It can be done with Canadian Whisky, Bourbon, and Rye. It is just perfection, the right balance of ingredient and depending on the whisky the flavors can vary greatly, but always a great drink. This week coctail is the Stinger, it lacks something, no big effect, maybe a higher quality Brandy or a dash of orange bitter would work. 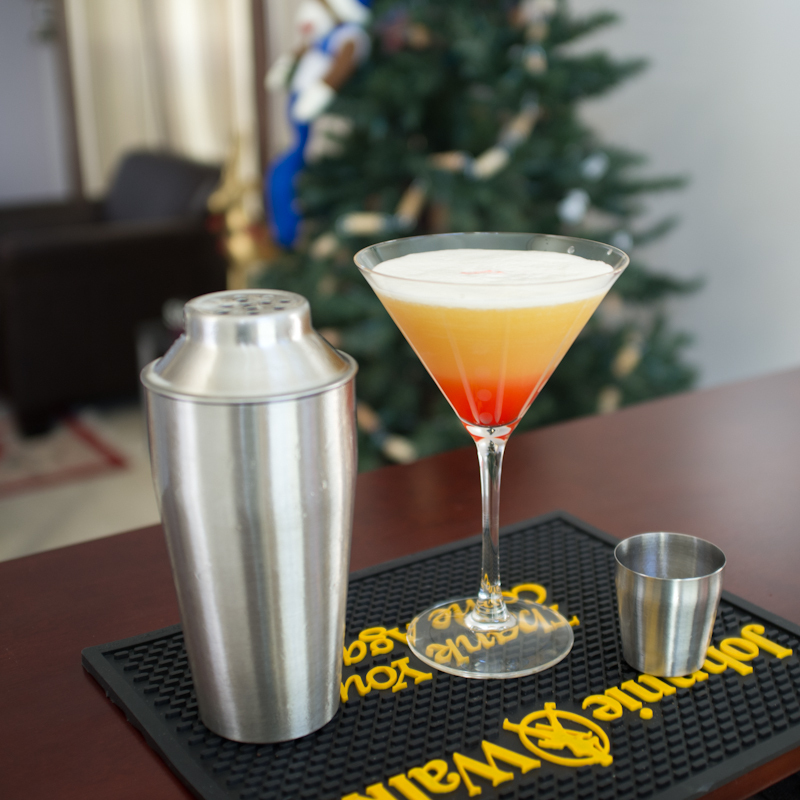 Our next coctail is Mary Pickford, a good coctail, on the sweet side, great for parties, easy to drink. Azwinegroup is going to go through the classic cocktails over the next few month, today is the Negroni, a great cocktail with the right balance of sweetness and bitterness. In Part III I discussed the different wines you should own in your collection. In this the fourth and final installment I will discuss how your overall collection will look at the highpoint of the first year and how to continue building. As you have by now purchased a complete assortment of wines for the year, or at least are planning to, your collection will look something like this. Fill in additional space with other reds and whites that you discover such as pinot gris, Barolo and special wines. Remember at least 1/3 of these bottles are going to be rotating out every year and your house wines may not even have to go in the fridge depending on where you live giving you ample room to lay down your special wines and avoid them. Begin saving for a 200-500 bottle storage solution. After 5 years you are going to have 40-60 bottles of world class Cabernet and Bordeaux alone. By design your house wine will become single vineyard fine vintage wines rivaling the best restaurant wine lists in the world. This is a good plan. Just as a restaurant would, keep a favorite “house wine” in rotation until you find something you like better or is a better value. When you go to wine tastings, restaurants, or out with friends, don’t order what you can have at home. Stretch yourself and try something new. You may find a house wine for the upcoming cellar rotation, or even better, a value or special wine to savor in the future. A few years ago my friend Andy corrected me when I said Meritage the “French way" (sounding like mirage), but off course there is no such word in French. The term was created by a group of Napa wine maker in the late 80's to describe a California Bordeaux blend. It was formed by joining the words Merit and heritage and is pronounced like Heritage not like Mirage. It was fun (in a sick way) to apply some basic statistical approach to something I enjoy so here is some parting thoughts on this topic. Napa has a wider spread in pricing than Sonoma’s. I think it makes sense, Napa makes a wide range of wines from daily drinker to cult wines and is better known to casual drinkers. Ask some of your casual wine drinking friends if they recognize the name Silver Oak, Modavi or Dumol? I think in most cases people will have heard of the Napa guys and have no idea about Dumol, Rochioli or Selyem all amazing Sonoma winery. This brings me to pricing and scores. Why are Napa prices and scores so strongly correlated? The simple look at it is that the better the wine is, the more expensive it is, therefore gets a high price and high score… Or is pricing driven by score? I would hope not. I believe this is one of those where we can say correlation doesn’t mean causation. Scores and prices are driven by other factors, such as production level, winemaker, weather, location, etc. Hope you enjoyed the series of articles. More to come in 2013.